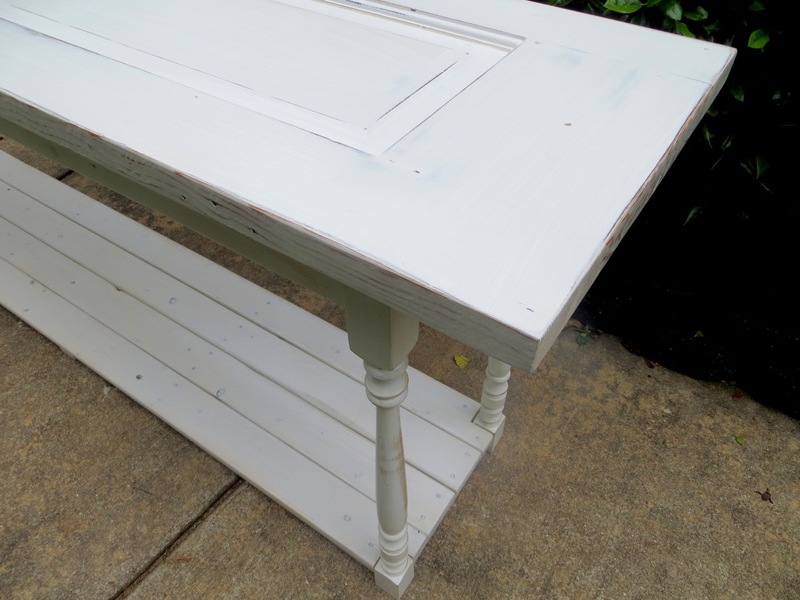 The Project Lady - DIY Tutorial – Make a Farmhouse Style Sofa Table! DIY Tutorial – Make a Farmhouse Style Sofa Table! 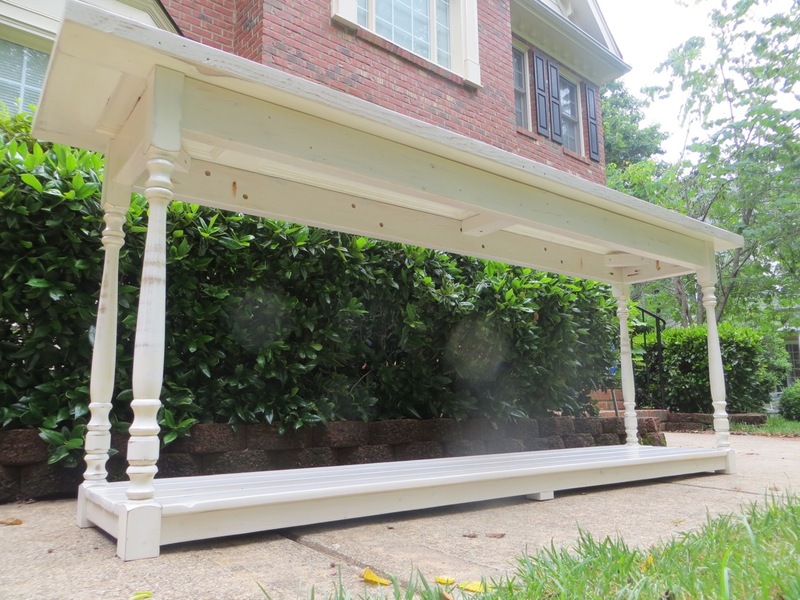 This has been a very rewarding project! 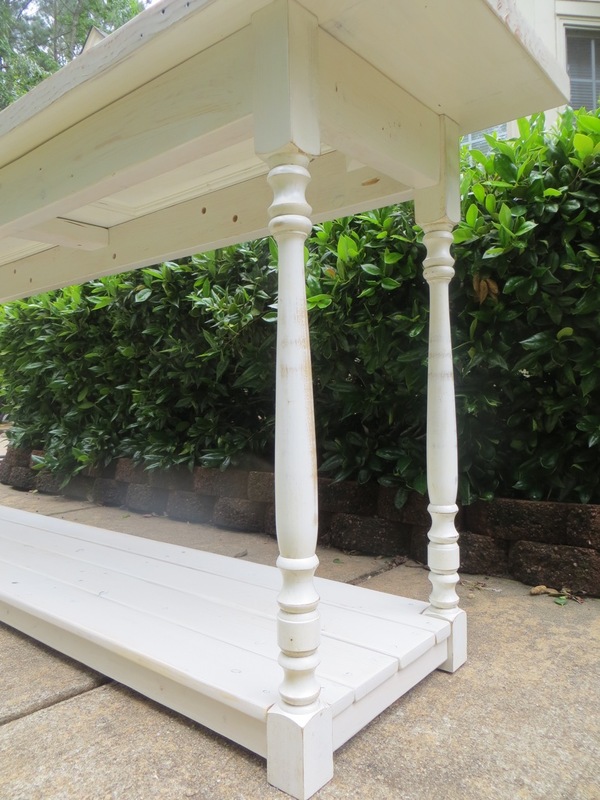 There’s nothing better for me than to turn something old & unwanted into something new and exciting! 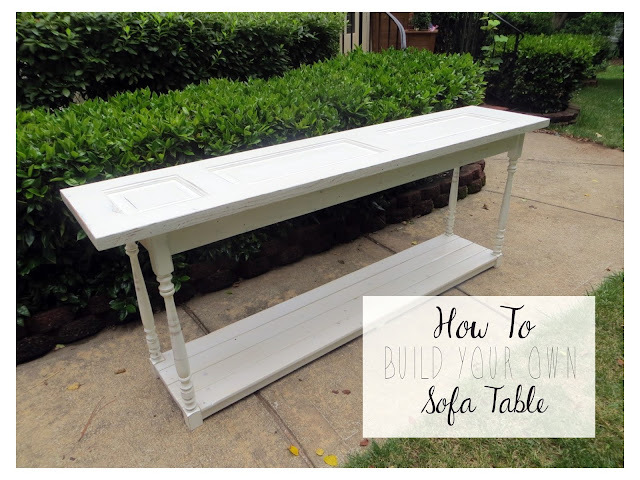 I’m happy to share with you how I made this long farmhouse-inspired table so you can make one yourself! We put this table in front of a panel of windows, but it would also look great in a long hallway, behind a sofa, or really – anywhere! 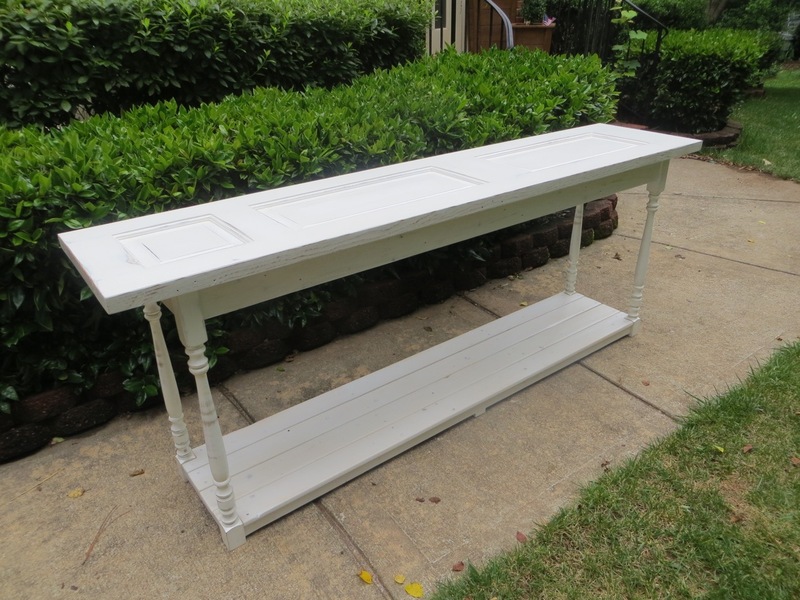 I found a beautiful solid wood door at Habitat for Humanity a few months ago along with some old railing spindles. 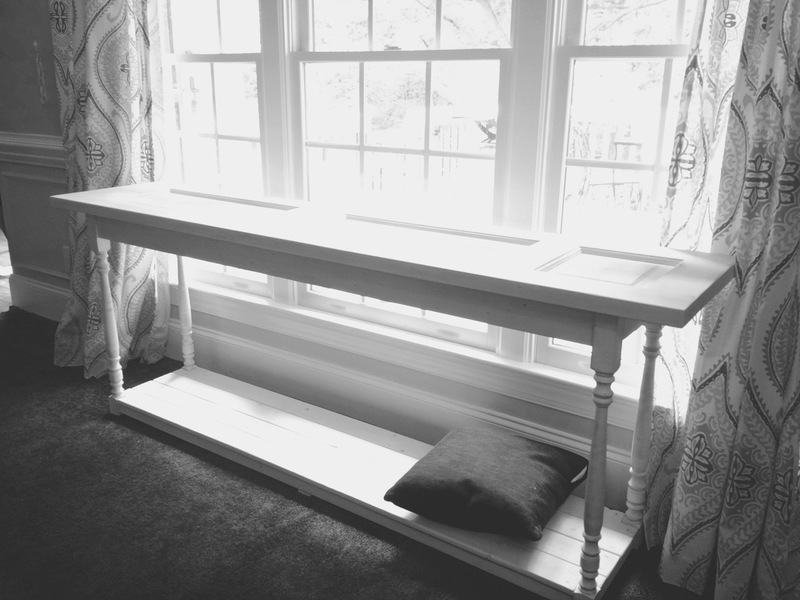 I brought them home planning to make a table to go in front of a set of windows in our living room and I finally got around to doing something with it! I didn’t have a plan drawn out or know exactly how it would turn out in the end (I actually cut the legs shorter in the middle of the project and ripped the door slightly smaller-I’ll spare you the details and tell you how to make the finished product)… because I didn’t have a plan I hope this tutorial is easy to follow! 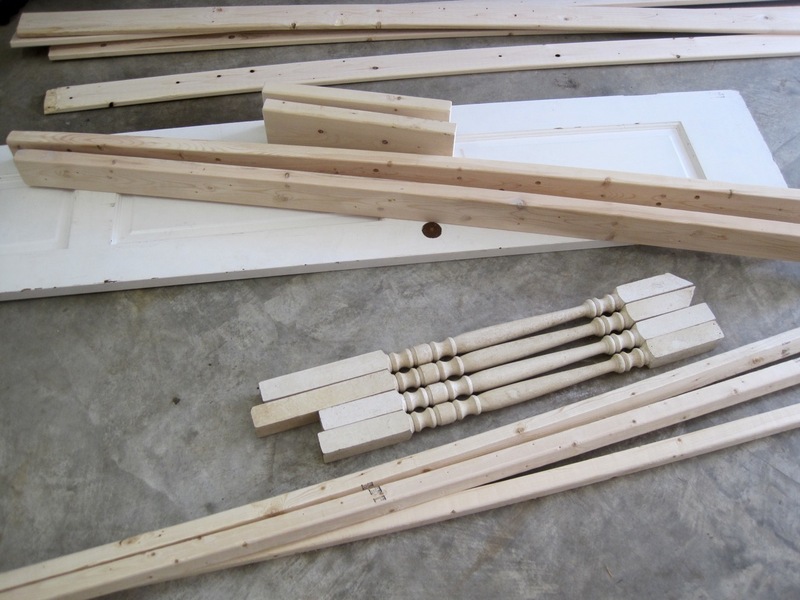 To start off I gathered a bunch of lumber I had in the garage and brought it out onto the floor so I could see the pieces together and figure out what looked best. Don’t have a door? 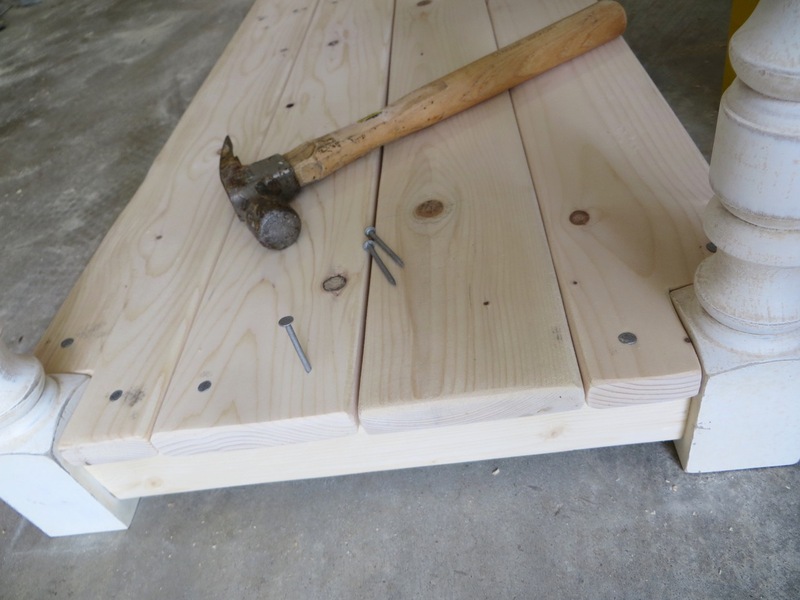 Substitute for dimensional lumber from your hardware store! 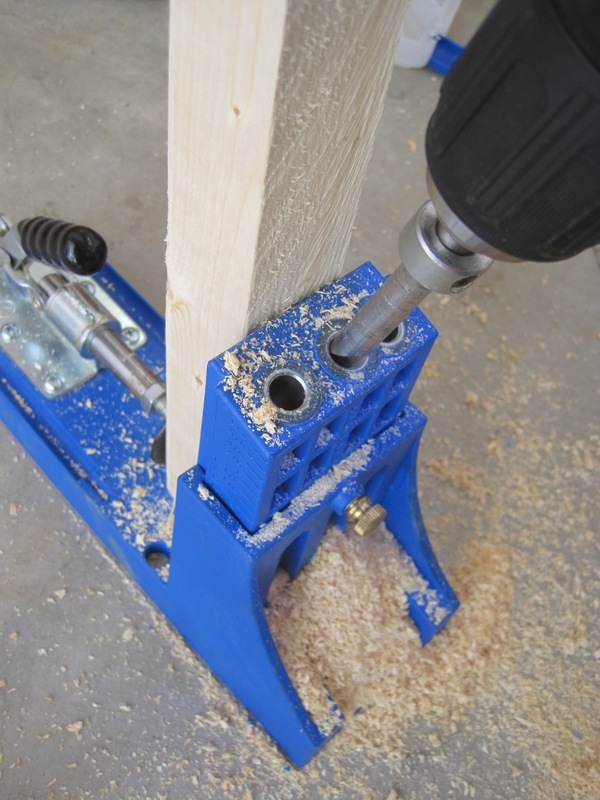 Don’t have old spindles? Buy new ones or improvise! 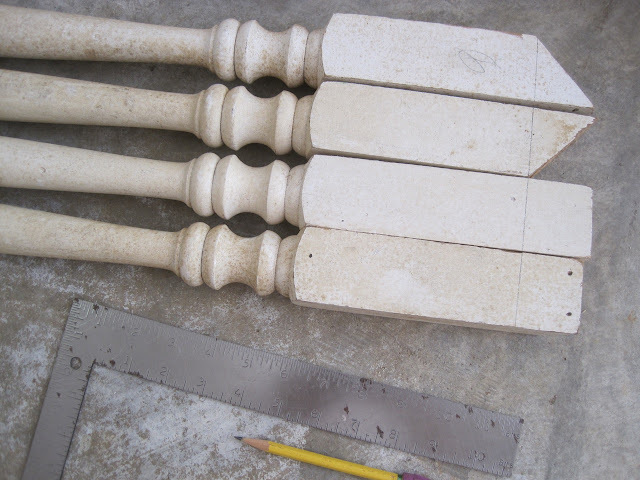 I lined up my spindles and made a line across each end to make them even with a total length of 28″. I made the top to have about 5″ of square for attaching my 2×4’s and the bottom about 2-1/2″ for attaching my 2×2’s. NOTE: My measurements all work around the width of my 1×4’s for the bottom shelf (I don’t have a table saw and didn’t want to rip them down). 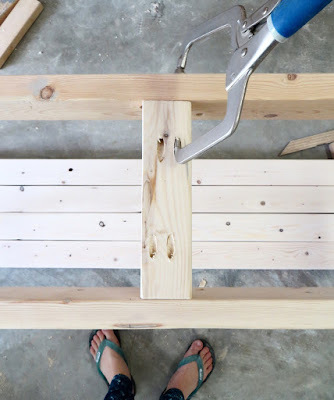 First, I laid my 4 shelf boards side-by-side, measured the total width and took into consideration that my spindles are 1-3/4″ wide and that I wanted my shelf boards to line up with the edges of my spindles but how I wanted the shelf supports/stretchers to be inset 1/4″ from the actual shelf. Whew.. got that? 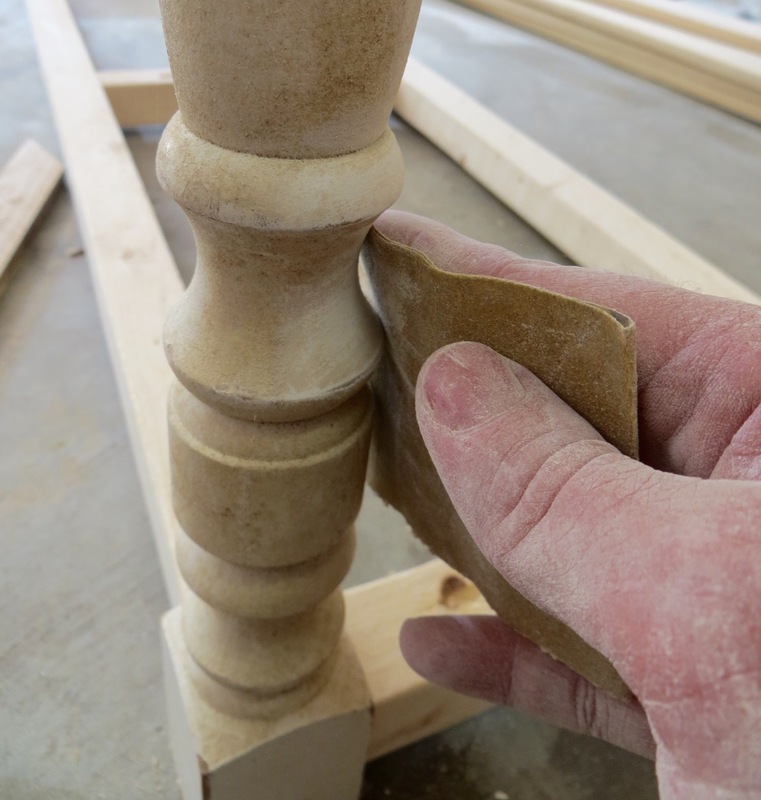 Why I say all that is maybe your spindles are a different thickness and you’ll need to do some math? 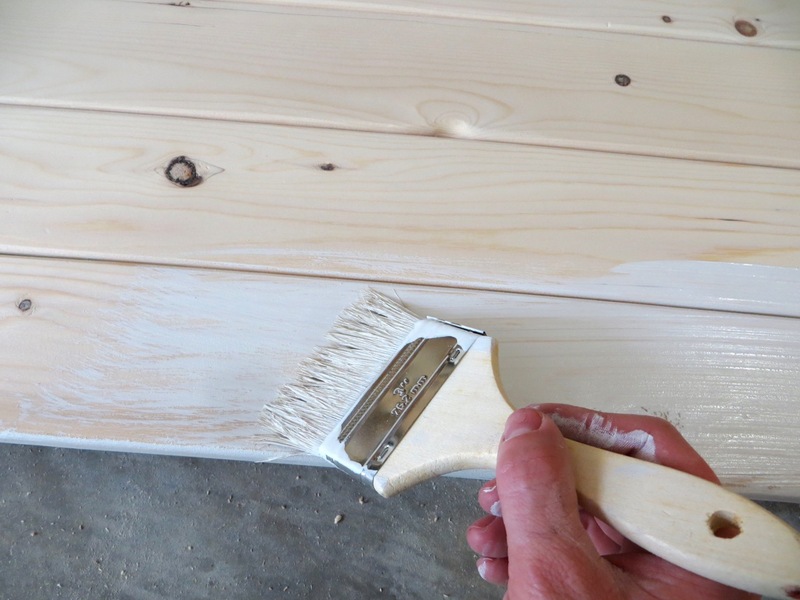 Sand all your boards with various grits to achieve a smooth finish. I started with 80 and went up to 150 on mine. 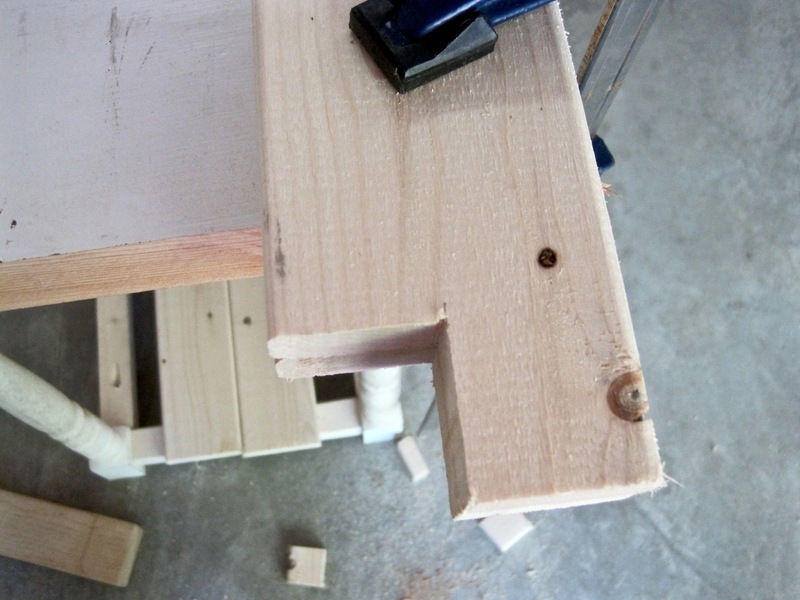 Make 2 pocket holes in each end of your 2×4’s. Pre-drill holes in the ends of your mitered corner braces. Layout all your pieces to make sure they line up well and look good. Clamp 2×4 side pieces to the top end of spindles and screw together with pocket hole screws (2-1/2″). Do this for both ends. Tip: Because my pieces are inset from the spindles I used spacers while attaching. 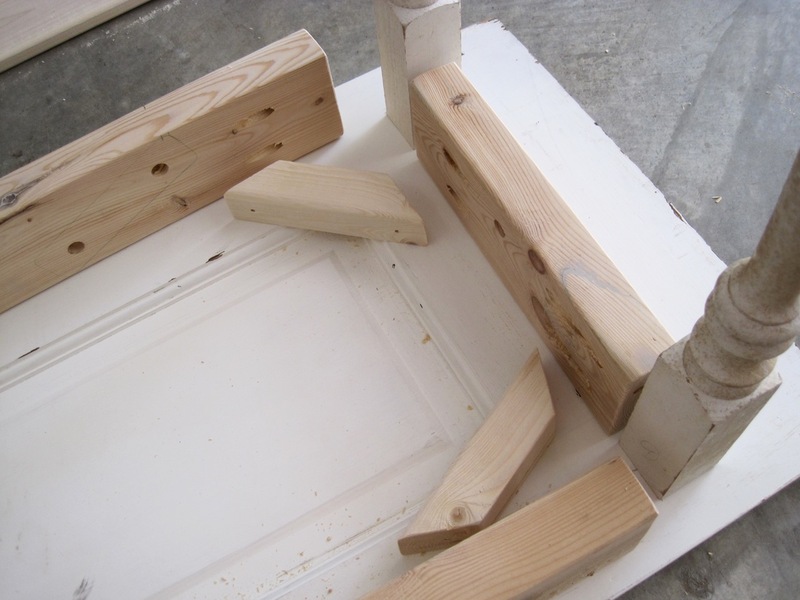 Attach the ends to the front/back 2×4’s in the same manner with spacers. 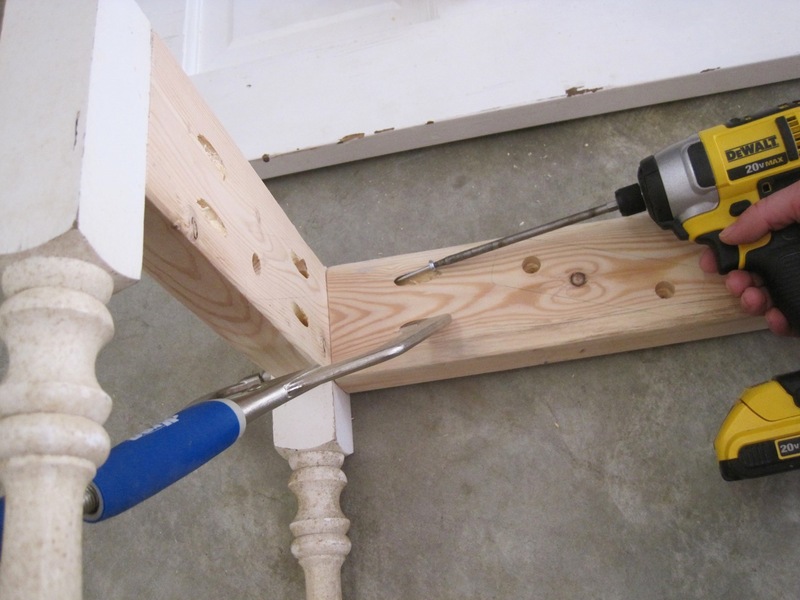 Clamp your corner braces and attach with regular 2-1/2″ screws. 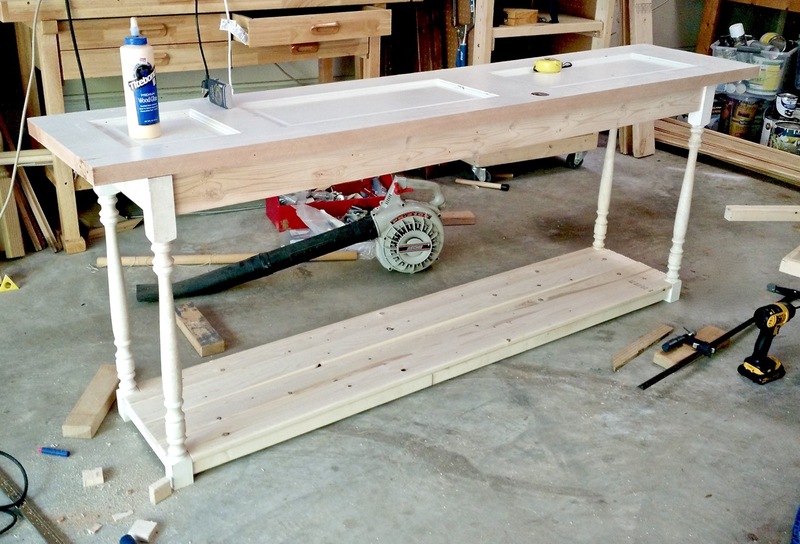 Tip: Measure opposite corners of base to ensure they are square to prevent a lopsided table. 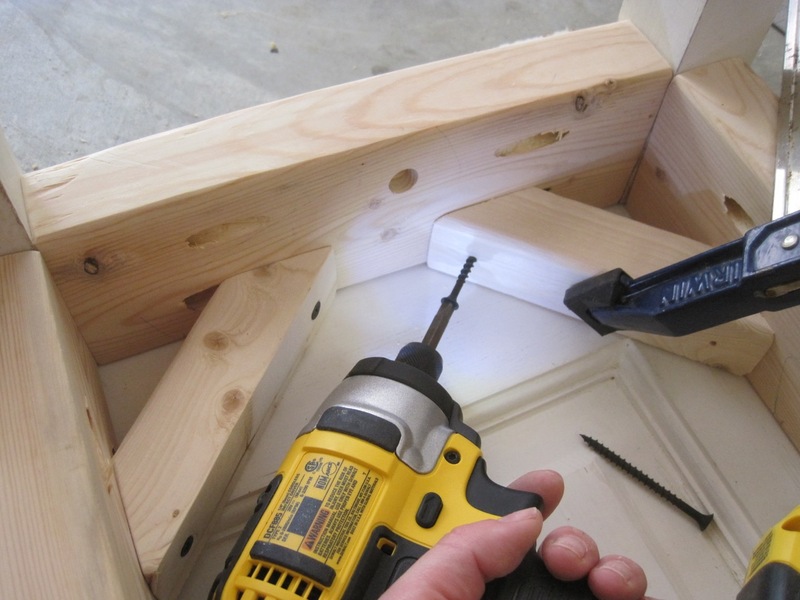 Drill a single pocket hole in each end of your 2×2’s for the bottom shelf. Lay out your pieces on the floor like this. You will only be attaching the 2 center braces for now. 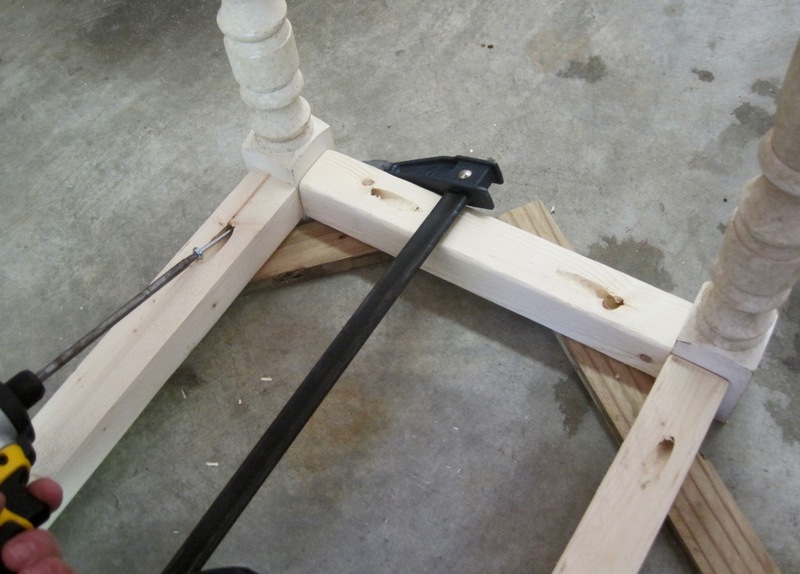 Clamp together while attaching. TIP: spacing isn’t important as long as the braces are square with the long pieces. Attach the side 2×2’s to the bottom of the spindles. Use spacers underneath according to how high you want your shelf sitting from the ground (mine is about 3/4″). Tip: Although you won’t see the pocket holes if they’re on the inside, I did mine on the top side so the shelf would cover them and there wouldn’t be a place for spiders to hide 🙂 … this makes it more difficult to screw in (I had to use my right-angle attachment for my drill)! 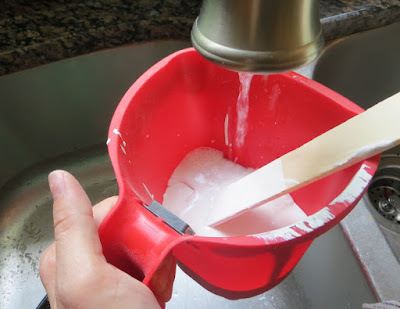 Attach the front/back 2×2’s in the same manner using spacers. 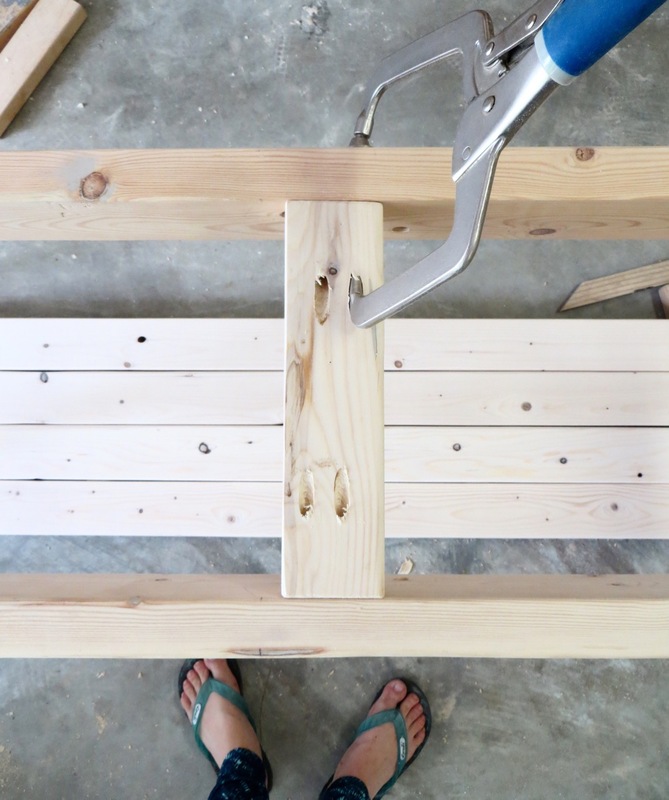 TIP: I didn’t want to get my long-heavy pipe clamps out so I clamped from the center braces to the side. I finally decided to clean up the gunky legs with some sand paper! 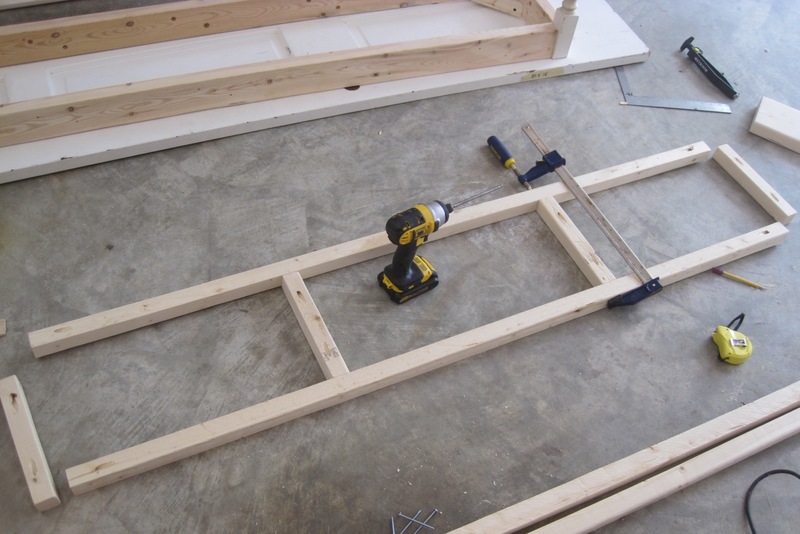 Lay out your 1×4 shelf boards over the shelf braces and mark where to cut your corners for the spindles. In my case, mine were a tad bigger than 1-3/4″. Sand the newly cut edges smooth. 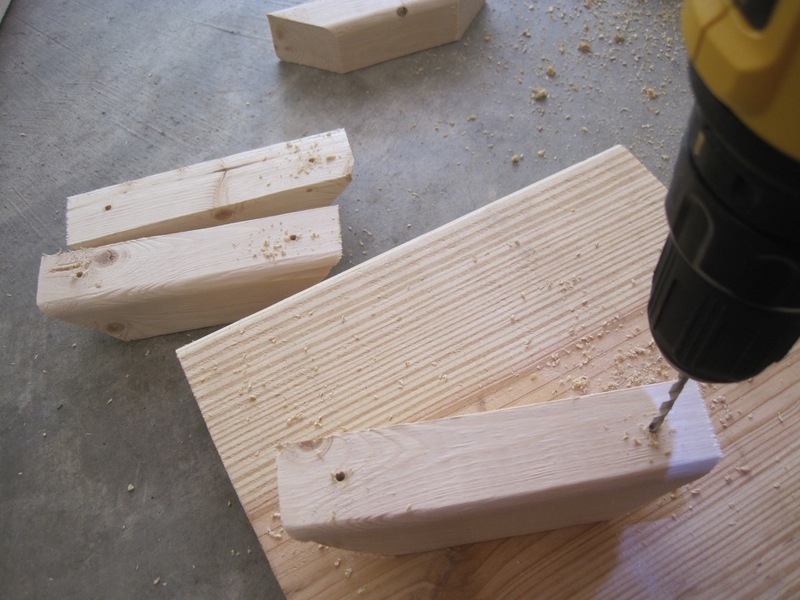 TIP: Consider how your boards will swell in humid-summer weather and make the cutout slightly bigger if needed. 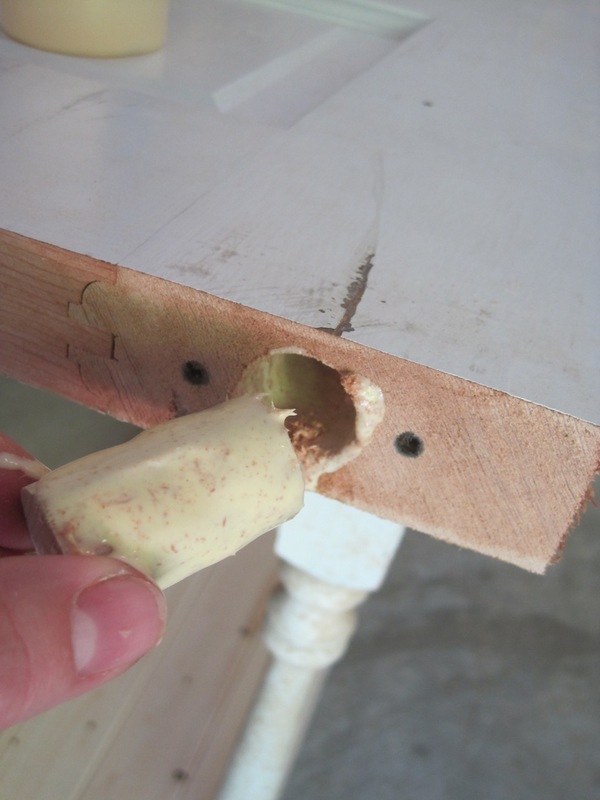 Use nails and secure shelf boards down. I did 2 in each end as well as 2 across each brace, totaling 32. Attach your 2×4 center brace flush with the top of your other 2×4’s. 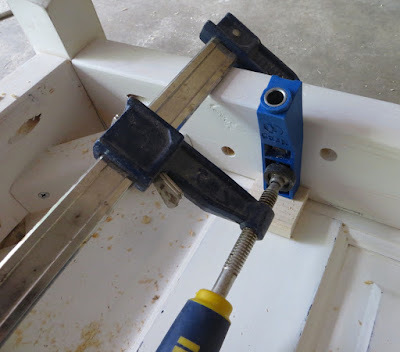 TIP: Because the panels on my door weren’t perfectly centered, I attached the brace where it would lay in-between panels, off-centered from the whole carcass. At this point I thought of how my kids would probably stand on the shelf and I added little feet to the center-bottom of the shelf. 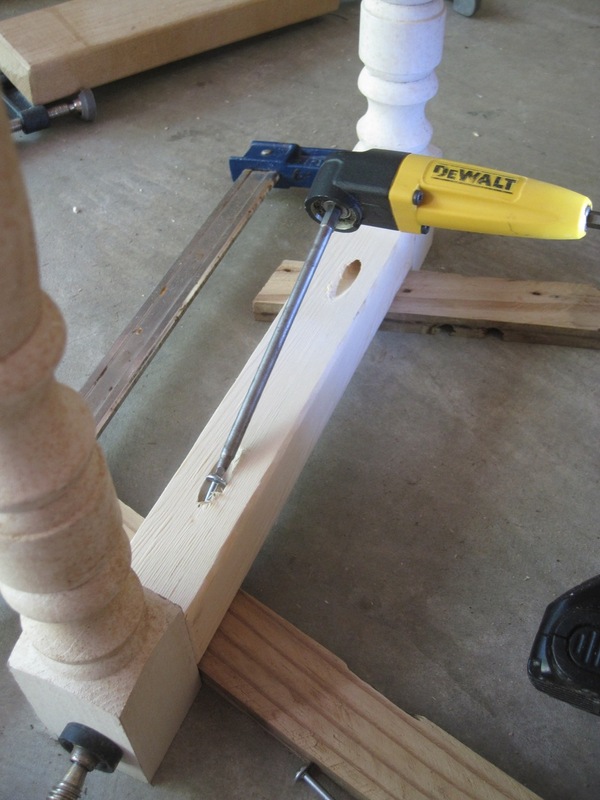 I used scrap wood from the spindles and made them the same height as the spacer I used for attaching the shelf brace to the spindles (about 3/4″) and used 1-1/2″ screws. 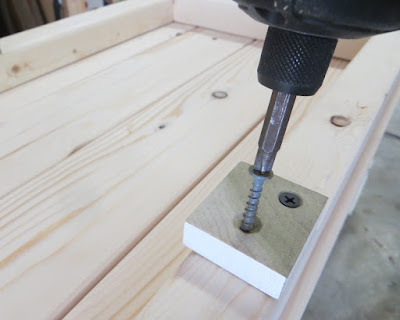 TIP: Make the heads of your screws sit down into the wood so they won’t touch/scrap any floors it sits on. I realized that I’d prefer to rip off some material on each side of my door to clean it up a little and get rid of the hinge cut-outs. 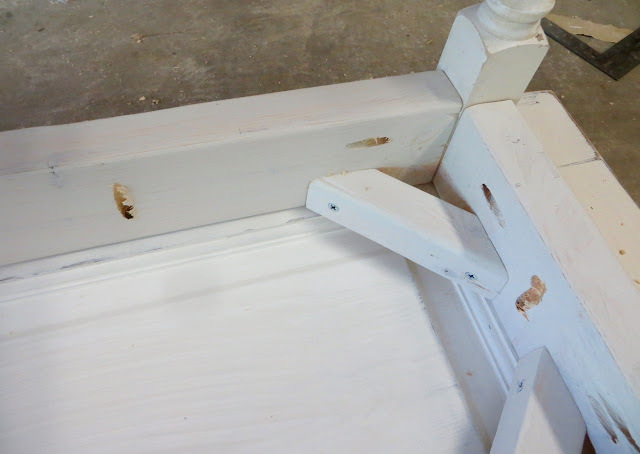 There was also a huge hole at the bottom where there was a metal wheel I plugged with a dowel (so glad it fit perfectly)! Remove all dust and prepare for paint! 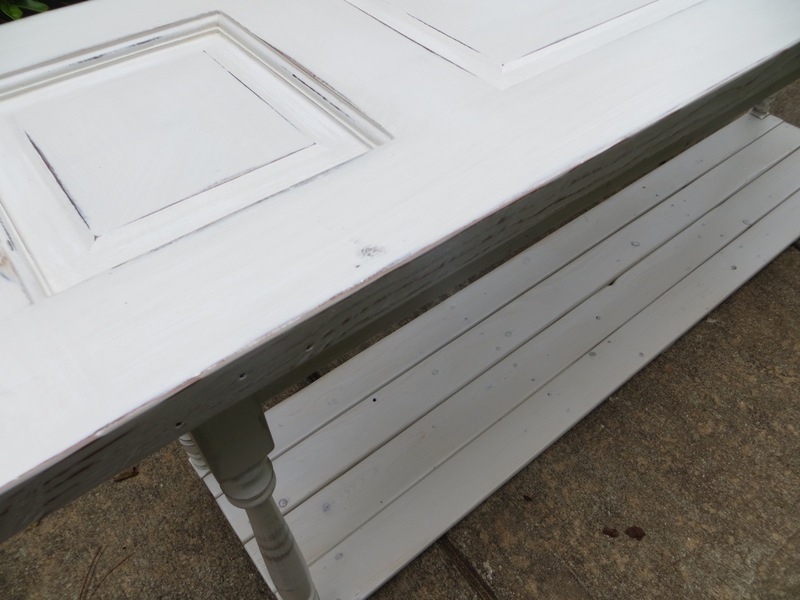 I watered down my flat-latex paint a little so it wouldn’t cover up the character of the wood underneath. 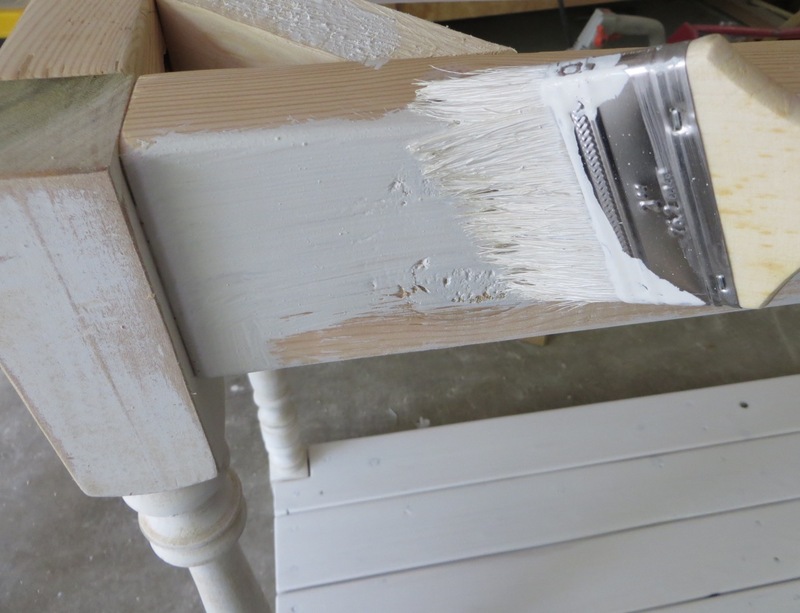 I tried to barely dip my brush in the paint so it was some-what dry and use fast strokes to ensure I wasn’t adding too much over the wood. I did a light-quick coat of paint, let dry and then sanded with 220 paper to remove the rough feel. 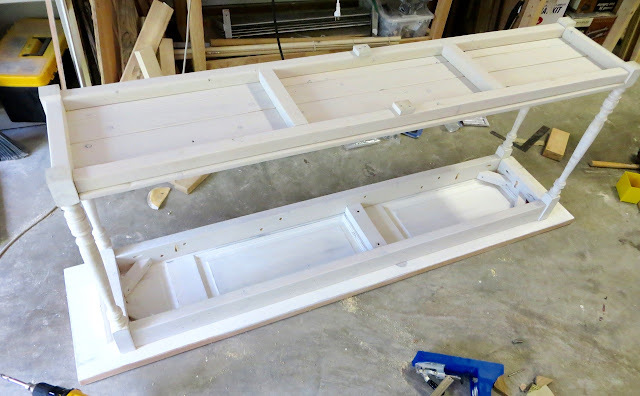 By this point I realized that my idea of attaching the door to the base through the corner braces wasn’t such a good idea after all because I’d need to use a spacer in-between because the panels weren’t flush with the entire door. 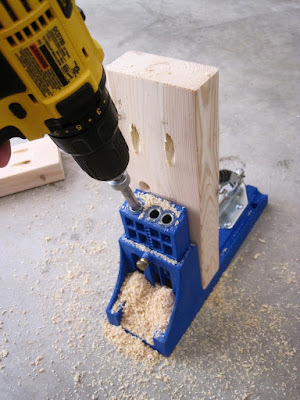 If this is your case, I used my nifty little Kreg Jig thing (needed a spacer under it to get the right height for 2-1/2″ screws). 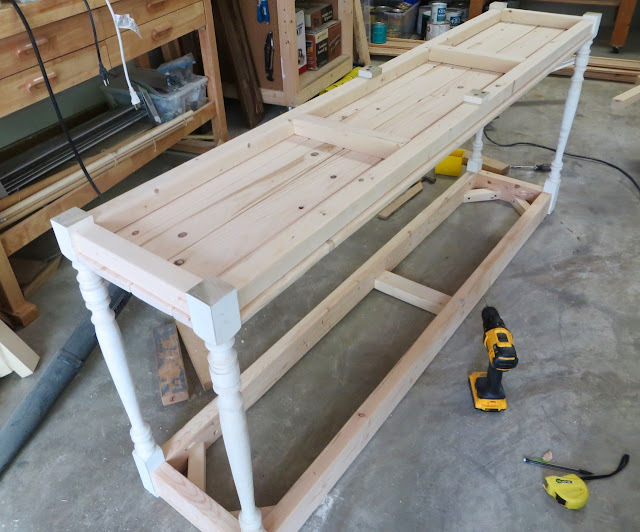 I did a screw on each short end, and one on each side about 12″ inward – totaling 6 screws. 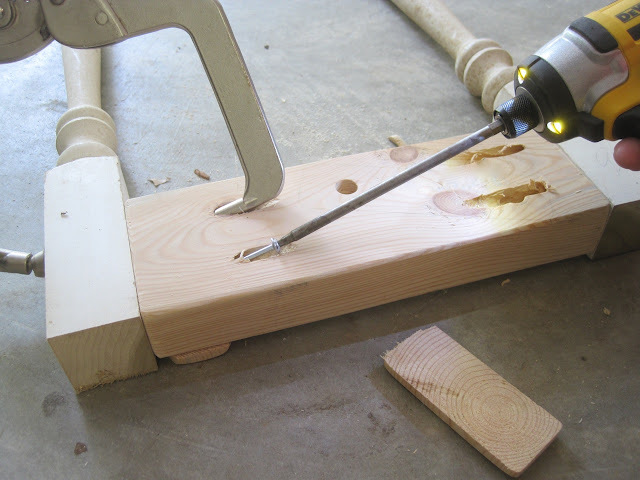 Pre-drill a few holes in the center 2×4 brace and use regular screws to attach door to the center of base. I flipped it back over, did a light coat of paint to the door, sanded, dusted… and done (too lazy to do a clear coat for now)! I’d love to hear what you think and if you use this tutorial to make one of your own! Great project! 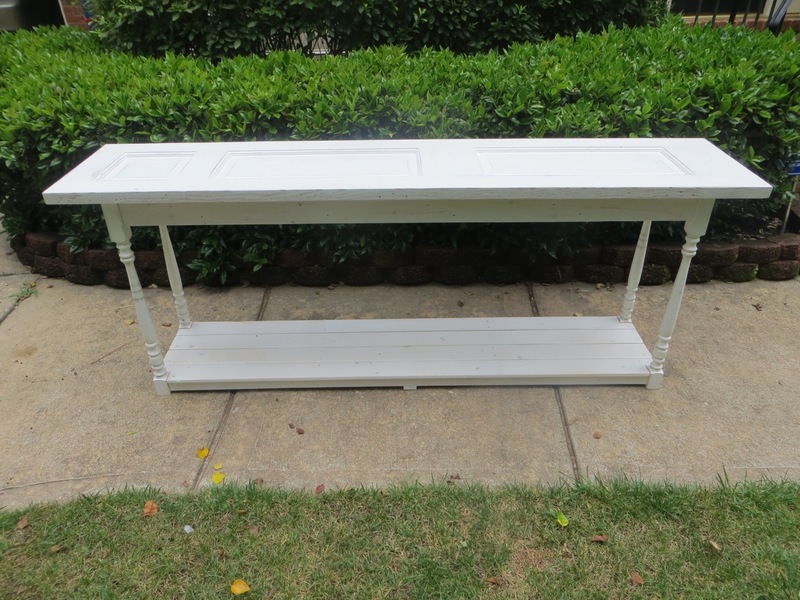 I want to make one in the near future; my try to convert into a table for behind a couch!